dance.net - REDUCED Gavin Doherty dress made for his own dancer. (10240763) - Read article: Ballet, Jazz, Modern, Hip Hop, Tap, Irish, Disco, Twirling, Cheer: Photos, Chat, Games, Jobs, Events! 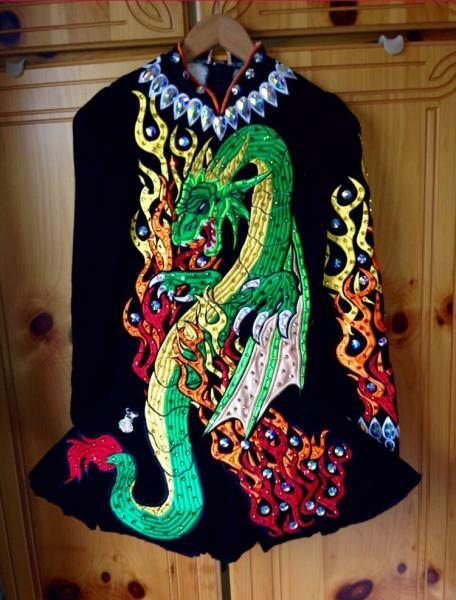 REDUCED Gavin Doherty dress made for his own dancer. Made by Gavin Doherty for one of his own dancers. Worn 6 times. Mid shoulder to belly button 17 1/2"
Belly button to end of skirt 14"
Full length front from V to end 27"
Come with black kick pants. 2" let down and 2" let out.